Pest description and crop damage Earwigs are slender, reddish-brown insects with a pair of forcep-like appendages at the tail end. A mature adult earwig ranges from 0.5 to 0.75 inch in length and has wings tucked under a short elytra sheath. 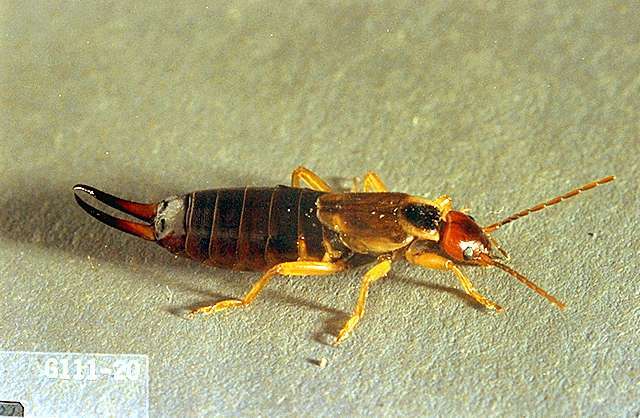 Immature earwigs are similar in appearance to the adults except smaller and wingless. Earwigs are nocturnal and hide under tree bark or soil debris during the day. They can prey on soft-bodied insects or scavenge on decaying vegetation. Earwigs can climb trees and chew holes between leaf veins, but this damage is rarely of any consequence. Earwigs can become pests when they chew irregular, shallow holes on ripening or overripe fruit. 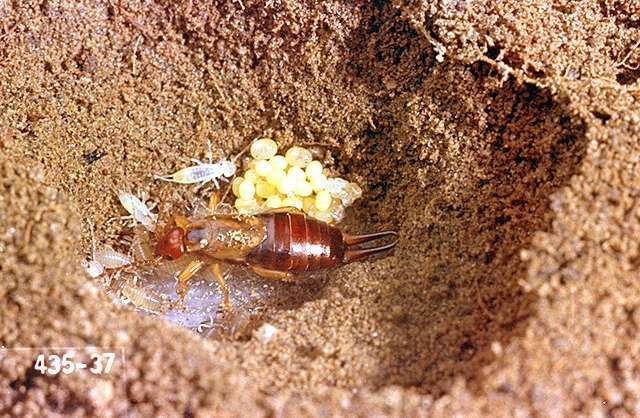 Biology and life history Earwigs overwinter just below the soil surface as both eggs and adults. In spring, females lay 20 to 50 smooth white to cream-color eggs in the soil. The young progress through four to five nymphal stages to adults by late summer. In fall, females may lay more eggs. Earwigs are active at night. During the day, they hide in moist, shady places such as compost piles or beneath stones, boards, and debris. They sometimes can be found in homes, particularly in summer, but they do no damage to house or contents. They rarely fly, but can move rapidly or can be moved by lumber, cars, luggage, or other means. They are attracted to lights at night. 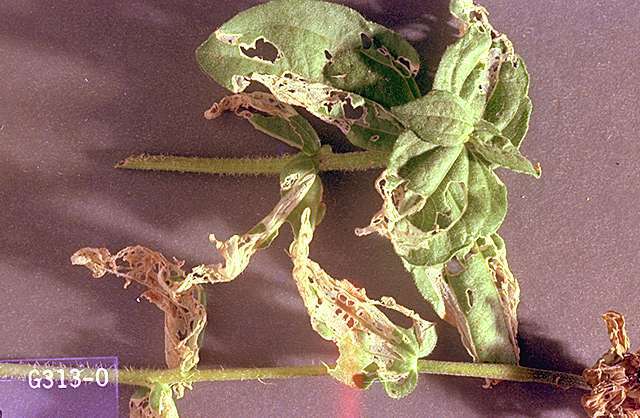 Pest monitoring Periodically scout fruit trees for signs of chewing insect leaf damage. If damage to young leaves is detected, confirm the presence of earwigs by placing corrugated cardboard, flat boards, roofing tiles or similar material on the ground that will provide daytime shelter for the nocturnal earwigs. Check the materials each morning for presence of the insects. 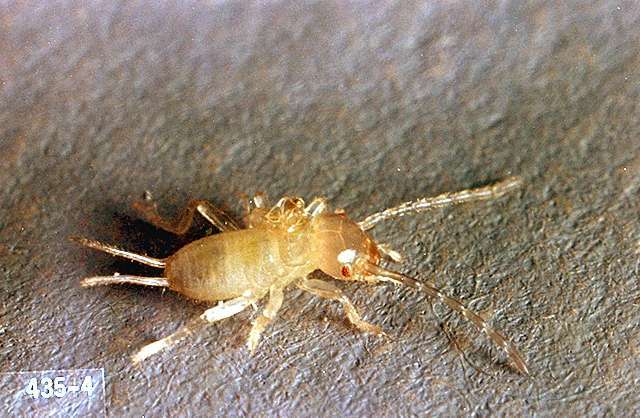 Infestations spread slowly as earwigs rarely fly. For tree ripened fruit, be sure to monitor earwig populations prior to harvest. Earwig abundance can be reduced by removing weeds and plant debris away from base of trees. Banding tree trunks with plastic wrap covered with sticky adhesive can prevent movement of earwigs into the tree canopy. Some of these treatments specifically target and intercept the immature and adult earwigs as they climb into the tree canopy at night. Warning: Many pesticides are hazardous to bees. Look for bee precautionary statements on product labels and do not use these products during bloom or if bees are foraging in the orchard. carbaryl-Apply as a spray around the trunk. kaolin-When sprayed on leaves, trunks and fruit, kaolin acts as a repellant to some insects. Some formulations are OMRI-listed for organic use. carbaryl (Carbaryl 4L) at 2 to 3 quarts/a. PHI 3 days. REI 12 hr. Apply on trunk and base of trees. Extremely toxic to aquatic invertebrates; avoid runoff and spray drift to surface waters. Limited to 3 in-season applications per year.